Home / News / Video / He just needs to remove 3 teeth from his mouth, but what the dentist did was HORRIBLE! He just needs to remove 3 teeth from his mouth, but what the dentist did was HORRIBLE! This man had a nightmare after going on a dentist. 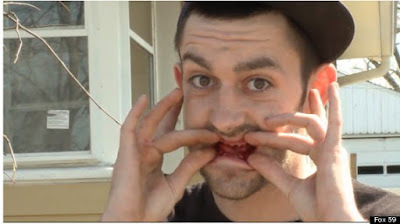 Christopher Crist, 21-year-old, went to a dentist to have 3 teeth pulled. But after a minute when the dentist gave him a pills to numb the pain, he was surprise that all of her 32 teeth was removed. Crist said that the dentist had removed each and everyone. He went to Amazing Family Dental in Indianapolis, where he has a “miscommunication” with the dentists after pulling all 32 of Crist’s teeth. Crist’s family instructed the dentist to just pull the three troubled teeth and nothing more. Crist was diagnosed with autism. "They pulled every last one of them," said Crist. "I am going to look like a freak now." After the incident with dentist, Crist was admitted to hospital where he’s reportedly battling an infection due to the dentistry debacle. Crist and his mother plans to sue the dentist. The dentist wasn’t named because no legal action has yet been taken and have witnesses to back them up. “It [the pills] made me loopy and as they were doing that, they were shooting my gums with the numbing gel. They took the first three that I asked them to and then they just kept going,” Crist explained her experience with the dentist. Sheena Cortez says she was in the exam room adjacent to Crist at the time of the procedure. She said she was in disbelief and that Crist's face "looked scary." Crist’s mother had been trying to get those records for days but still have not received anything from the dentist. Another patient, Rose Hill, also went to Amazing Family Dental. She told the dentist to pull just one tooth that was bothering her. But the dentist pulled her entire bottom row. Reports went to Amazing Family Dental for an explanation, but the doctor never came out of his office instead he told his staff to call the police.